"My family loves ham like this. 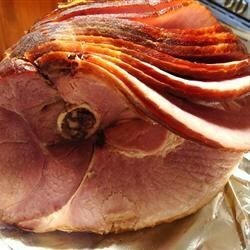 Sweetly seasoned ham roasted with moist heat is a delicious way to celebrate special occasions. If using a pre-cooked ham, follow the directions on the package for baking times." Bake for 4 1/2 to 5 hours in the preheated oven (about 22 minutes per pound), or until the internal temperature of the ham has reached 160 degrees F (72 degrees C). Make sure the meat thermometer is not touching the bone. Let stand for about 20 minutes before carving. See how to make an easy, old-fashioned baked ham with cloves and brown sugar. I've made this twice now and both times it has been perfect! It's the moistest ham I've ever made. Thanks for the recipe! This recipe is too easy and totally delicious. I used a pre-cooked ham so I added the juices from the bottom of the package. It was the best easiest ham recipe that i could find. It was so easy even I could do it!